If Republicans have their way, curbing air and water pollution will take a back seat to maximizing profits. You might be getting a whiff of something rotten in Washington, but a worse stench might soon waft into your neighborhood as President Trump moves to slash regulations that protect our air and water from polluters. The aptly titled Searching for and Cutting Regulations that are Unnecessarily Burdensome (SCRUB) Act, proposed by Representative Jason Smith of Missouri with support from the White House, would create a new arm of government to comb federal agencies for regulations deemed to be “obsolete,” or rather, unfairly inhibiting profits. SCRUB would essentially allow politicians to “review” regulations through a purely economic cost-benefit analysis: If the Environmental Protection Agency issues a standard for particulate emissions for example, SCRUB would force the government to assess the rule based not so much on how it might save children’s lives, reduce lost days of work or school productivity, or keep fish from dying in local streams—but, rather, on how the regulation would affect business. And invariably, business interests don’t line up with the value of a clean habitat, so if SCRUB passes, Congress gets a blank check to erase the rules and directives needed to implement federal statutes, which in turn would cripple federal authorities’ partnerships with local agencies in monitoring, coordinating, and controlling pollution on the community and regional levels. Nationwide, people of color are 40 percent more exposed to smog pollution than whites. “Taken to its absurd end, [this bill says] you can’t have cleaner air if you want cleaner water. You have to repeal the clean air rule to promulgate a clean-water rule,” Billings says. Needless to say, the benefits of both breathing and drinking without being poisoned are cumulative. Under this proposal if new evidence finds that another substance widely used in commerce today is harmful to infants, regulators would have to find some other protection, which still needs to be enforced, to cut before protecting young children. This one-size-fits-all approach is short-sighted and ties the hands of agency staff when public health crises or new threats arise. An even broader SCRUB-type anti-regulatory assault, the Regulatory Accountability Act, has already passed the House and now awaits Senate consideration. The measure would facilitate the wholesale repeal of public-interest rules that are, in the most recent version, projected to cost the economy $100 million or more annually. The business cost, in flat financial terms, would trigger a review process that critics say gives politicians outsized power to preempt federal rulemaking via “paralysis by analysis,” gumming up the works to block agencies from inhibiting industrial production. This undermines a longstanding legal precedent of deferring to agency expertise to determine how federal laws are implemented in regulators’ day-to-day operations. The war on regulations might also be aggravated by the destruction of public-health protections through the repeal of the Affordable Care Act and Trump’s plan to defund the prevention-research arm of the Centers for Disease Control, both of which provide key research and treatment resources to help poor communities deal with the disparate health impacts of pollution and toxic emissions. According to the American Lung Association, most Americans “live in counties that have unhealthful levels of either ozone or particle pollution.” People of color are over 40 percent more exposed to smog (nitrogen dioxide) than whites. 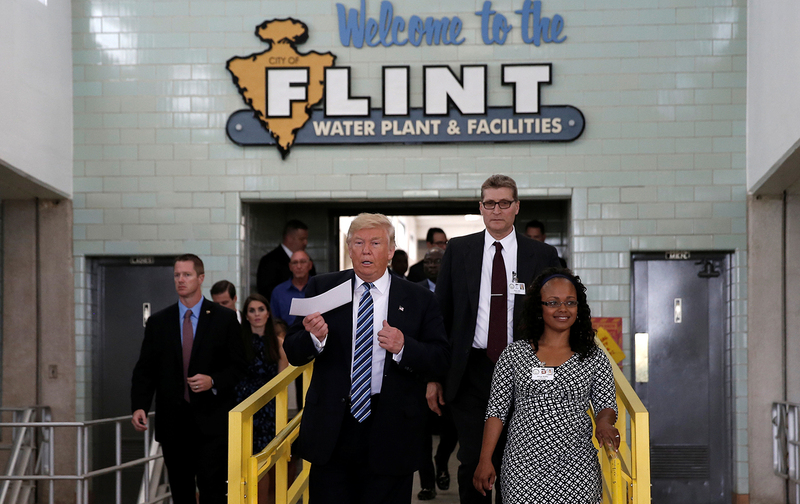 Poor communities of color are also more exposed to industrial disasters, like the poisoned water of the majority-black city of Flint, Michigan, and the toxin-steeped mining towns of Appalachia. Trump’s right that regulations exact a price. But the short-term calculations of big business to put a market rate on a public good are always regressive, and the ultimate price is paid through the sickened bodies of those who can least afford the burden.